Graph of the Week: U.S. Soldiers Died from What? Prior to WWII, the majority of soldiers died from disease and infection. Imagine the scene: thousands of military men laying on cots, makeshift beds, or the floor - any place that was available was filled with a wounded soldier. Understand that these aren't the scratches you see in everyday life; rather, these are war wounds from heavy lead balls that shatter the bones of an arm or a leg. Take one into the gut or head and death was all but certain. This knowledge was not lost on the men of the Civil War as their screams echoed throughout the makeshift hospitals like the wails of the damned. It's not from lack of chloroform; no, it's from the horror of seeing a surgeon literally saw off a man's arm, tossing the lifeless appendage into a grotesque pile of discarded flesh on the floor. Or perhaps you scream in terror when the surgeon, facing you with a bloody saw as bits of human flesh hang off of it, quietly informs you that your leg is next to join the rotting mass. Perhaps you are a fresh Union recruit setting up camp. The first couple of days aren't so bad, but things begin to change. A putrid stench assails your nostrils wherever you go - the vast majority of the men have some form of chronic diarrhea and relieve themselves fairly close to camp. In need of any able bodies, the Union also recruited the frail and weak - they are sick with typhoid fever and other diseases, spreading it to other soldiers. Further, the area looks like a dump site as refuse covers the ground, spreading bacteria like wildfire. Indeed, many of the men here will die before ever seeing their Confederate foes (who had it even worse). Look at the above graph. 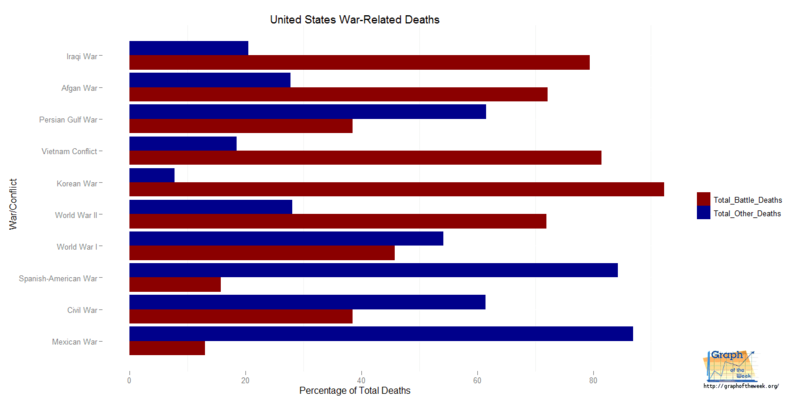 During the Civil War (only Union casualties shown), over 60% of deaths did not come during battle (for wars prior, that figure was even higher). They came from disease, infections, malnourishment and exposure. Death by bullet was a greatly preferred end for most soldiers. World War I Was Better, Right? Picture yourself as a new arrival to the front lines. Before you even spot the first trench, you are overcome with a number of horrific smells forcing you to retch on the spot. As you slog your way around, there are thousands of dead bodies lying around, mostly in shallow graves, but that hardly protects them (or you). The putrid stench of decaying flesh clings to your skin, enveloping you. You see something brown scurrying around near a corpse: it's a cat-sized rat feeding on a noble soldier. They typically go for the eyes first, then the liver, leaving an already frightful body grossly misshapen. Turning your head away in disgust, you finally make your way to the trenches. Inside there are men going about their tasks, yet one of them is moaning. He is the victim of 'trench fever' - a nasty disease from lice that sometimes required weeks from which to recover. All sorts of frogs, beetles, rats and other vermin crawl around with the men spreading disease and filth, not to mention the oozing latrines. If ever there was a Hell on Earth, surely this must have been it. Although some medical improvements had been made, over 50% of the men died from non-battle causes during this war. Luckily(? ), this would be the last time history would witness such overwhelming war-related deaths from disease. After World War I, there were several key advances made in the medical field which had a drastic effect upon warfare. During World War II, mass vaccinations against such diseases as Yellow Fever were implemented with very successful results. Additionally, infections were being cured at a significantly higher rate due to the invention of antibiotics (notably Penicillin). Further, blood transfusions were finally practical due to the discovery of the four main blood types (in the past, ignorance of these blood types often led to death with a transfusion). These changes in medical procedure prevented many soldiers from what a few decades ago would have been certain death. As a result, the number of troops surviving their wounds skyrocketed since that time. 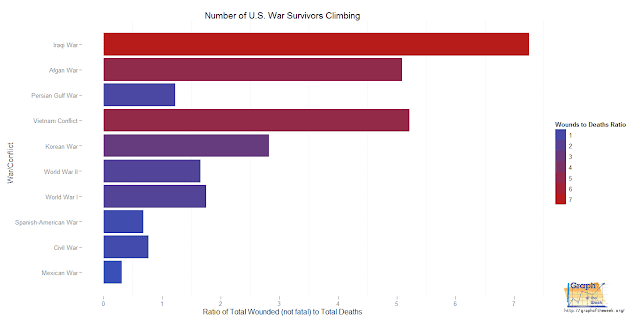 Looking at the chart below, we can see that the ratio of wounded soldiers to those killed in action has gone up significantly. More soldiers are surviving their wounds. This has changed the dynamics of war considerably, especially when it comes to treatment. Our soldiers are surviving horrific wounds: many return missing appendages, are disfigured, or have severe mental trauma just to name a few. The cost for ongoing care for these brave souls surely has gone up. Hopefully all of this is budgeted before the United States enters into any further military action. Switching gears a bit, consider this: if you have a roof over your head, it would be prudent to keep yourself clean and healthy. After all, hundreds of thousands have gone before you and died horrific deaths to provide that opportunity. The fact that this country is becoming less healthy (future graph coming) is a troubling trend. War has existed since the dawn of mankind. It is sometimes a necessary action to take to prevent aggressors from destroying our freedoms. While investment into our military has provided many technological advances, there is no doubt that the cost for this is quite high in terms of human life as well as money. Further, the cost of war now extends far beyond the actual conflict; these soldiers often need care for the remainder of their lives. All things being equal, the rise of robotics should reduce the number of casualties and wounded alike - at least for the side who is wielding them. No matter how you slice it, war certainly reveals our dualistic nature to simultaneously exhibit both honorable and horrifying traits. 1) To what capacity can drones replace soldiers? 2) Will deaths from disease increase again if warfare is waged with biological weapons? 3) Will there ever be a time when wars are no longer necessary? Interesting! I wonder if the first graph would be clearer as a dot plot rather than bars. I tried working that first plot about a hundred different ways. Not happy with any of them, including the one published. I agree that it needs reworking to make it a bit easier to read. Patrick, you present an insightful analysis. As to your question on whether drones could eliminate the sufferance, I suppose the answer would depend on which side was considered—ours? or the “political enemy”? For the latter, the answer would be a definite, “NO,” for thousands of civilians have died. And to whether war can be avoided also depends on whom you ask—the oil corporations (others), the military defense contractors and the mercenary contractors (i.e., Blackwater) all would shout “NO!” For them: War = profits, Not patriotism. Haha. I meant it in the more abstract way - our military robots vs theirs (in whatever form that would take). And it would be pretty fun to watch if our 'wars' were just like the BattleBots competitions that have been on TV (as your research showed). So what happened in the Persian Gulf War? The graphs show other deaths >> than battle deaths and the wound to death ratio as 1. This reverses trends since WWII. Good question. I forgot to say something about that in the main article. There were so few battle deaths in that war (on our side) that the number of accidents was larger. In any year, the number of accidents in the military numbers in the hundreds - every year, even in peacetime (if fact, the trend rises during peacetime). So, when you lose less than 200 souls during the entire war, you will inevitably end up with more deaths by accident - which is much different than succumbing to disease. Question 1 http://www.iar-gwu.org/node/144 Very interesting article speaking on the use of drones as far back as WWII. The use of drones would decrease the amount of military casualities, but on the other would increase the amount of civilian casualities.. Good read over all..
That's a very interesting article. Drones will continue to get 'smarter' and I'm certain that they will become more autonomous in the future. This hits the nail right on the head. It talks about BW attacking livestock, crops,the ecosystem, and the potential survival of a nation. Since Desert Storm, there has been an increase of cancer deaths, rare diseases, and infants of exposed military personnel have the funky genetic anomalies. I have seen some of this first hand working in medicine. Makes you wonder what nasty chemicals, or BW they were exposed to. There are "trends" that are cyclical in life, this seems to be one of those even with the advances made to protect the troops. Has there been a percentage rise in those rare deaths or just by absolute numbers? And I'd be curious if that rise correlates to the civilian population as well. Seems to me that lots of 'weird' diseases have arisen in the last century. War unfortunately creates money and revenue. So long as there is unrest in the world, or militants, or combatants, there will be war of some type present.